Physics is the only subject I know of which allows a person to look out of a telescope, measure the spectral lines emitted from a gas cloud way out in outer space, and determine the origins of the universe. Sherlock Holmes makes some brilliant deductions in Sir Arthur Conan Doyle’s masterpieces, but I have to say, physicists have surpassed any deduction made by the great Holmes! It’s time to solve a great mystery! First you stick a radio antenna up into the air and receive a tiny bit of static. What could that be? It must be random emissions from the atmosphere. So you move the antenna around, yet no matter which direction you point it you get the same static. It’s annoying the hell out of you, but it’s quite intriguing nonetheless. Hmm. It’s time to sit back in your armchair, get out the tabacco pipe, light up the fire, take a few puffs and think this one through. Your butler brings you in a cup of hot cocoa, “Thank you”, “Now if you’ll excuse me master.” After the butler leaves you get up from the chair, take a few puffs from your pipe, and pace around the room. What could this be? You’ve checked the circuitry thoroughly, you’ve cleaned off the birds which have been nesting up on your dish, you’ve double checked all your scopes and equipment… It’s not an equipment malfunction yet where could all this background radiation be coming from? Being the physicist that you are you know that the small things lead to much bigger things. Everything must be accounted for. Nothing is random. Every observation matters and this troublesome static cannot be ignored. You theorize that this may well be the same sort of blackbody radiation which was researched by Dr. Planck and Einstein. If you take the universe back far enough, cramming all that matter into a smaller and smaller space, the temperature increases. You theorize that this radiation originates in that original explosion. It’s all been cooling down since the big-bang. My my my. Things are getting interesting. If you haven’t already, you need to read Steven Weinberg’s The First Three Minutes! For instance, Penzias and Wilson found that the intensity of the microwave static they had discovered corresponded to a temperature of roughly 3° K. This is just what would be expected if the universe has expanded by a factor of 1000 since the time when the temperature was high enough (3000° K) to keep matter and radiation in thermal equilibrium. If this interpretation is correct, the 3° K radio static is by far the most ancient signal received by astronomers, having been emitted long before the light from the most distant galaxies that we can see. But Penzias and Wilson had measured the intensity of the cosmic radio static at only one wavelength, 7.35 centimetres. Immediately it became a matter of extreme urgency to decide whether the distribution of radiant energy with wavelength is described by the Planck black-body formula, as would be expected if this really were red-shifted fossil radiation left over from some epoch when the radiation and matter of the universe were in thermal equilibrium. If so, then the ‘equivalent temperature’, calculated by matching the observed radio noise intensity to the Planck formula, should have the same value at all wavelengths as at the 7.35 centimetre wavelength studied by Penzias and Wilson. Now you’re skipping across the room. Ha ha ha haaaa haaaaa, da da da daddhhhaaa! Ah ha! Yes yes! It’s obvious what must be done. We need more observations! But we have a problem — the atmosphere. It blocks various wavelengths of incoming radiation and is in the way. We need to get out into space. If we were to take more observations out there beyond the atmospheric blanket, and all the background static radiation we received followed the Planck black-body formula for a 3 degree Kelvin temperature… How telling that would be! To the lab! You call the in butler. Ready the car, there’s work to be done! But how in the world can you get out into space? Hmm, troublesome indeed. You’re quite wealthy, but building your own rocket, launching your own satellite out into orbit, just to make some background observations… not very practical. Argh. What to do, what to do. But you’re a skilled physicist. You’ve been in this sort of situation before. There’s never enough money for science equipment. You’re going to have to be clever. Ah yes, the fundamental rule of science: every individual atom contains in its motion and properties the entire story of the universe if you’re only clever enough to deduce it. Back to your study. If you can only think up an experiment. Well, the atmosphere blocks some wavelengths of radiation, but not others. What if you were to search through the visible spectrum. Hmmm. 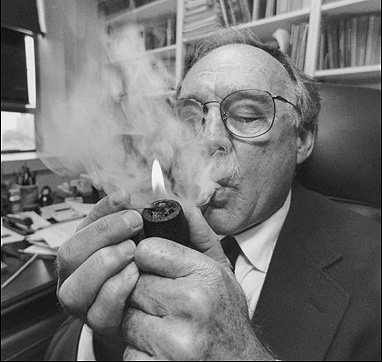 You throw your legs up on your desk, puff your pipe, lean back, and exhale a plume of smoke. You close your eyes and picture yourself looking out of the giant telescope back in the observatory. In your imagination you pan around gazing, then… Yes. YES. The Ophichus constellation. There’s a gas cloud out there inbetween a star and the Earth which will do nicely! But before you call in the butler, you finish your smoke. This will require some subtle reasoning but you wonder if maybe, just maybe, by examining the dark bands in the spectral analysis from this distant gas cloud, you’ll see a slight perturbation in molecular motion induced by the background radiation. You know how the spectrum is supposed to look because you can observe this gas and test its properties in your lab. That’s not too hard to do. Oddly enough, the radiation background was measured at shorter wavelengths, long before any of the astronomical work discussed so far in this chapter, and by an optical rather than by a radio or infra-red astronomer! 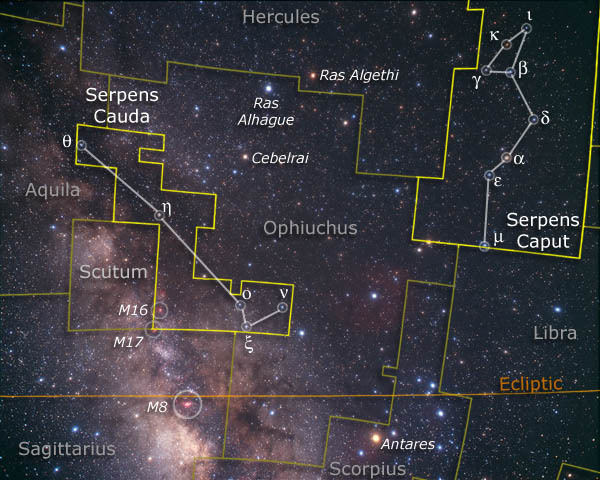 In the constellation Ophiuchus (‘the serpent bearer’) there is a cloud of interstellar gas which happens to lie between the earth and a hot but otherwise unremarkable star, t, Oph. The spectrum of S; Oph is crossed with a number of unusual dark bands, indicating that the intervening gas is absorbing light at a set of sharp wavelengths. These are the wavelengths at which photons have just the energies required to induce transitions in the molecules of the gas cloud, from states of lower to states of higher energy. (Molecules, like atoms, exist only in states of distinct, or ‘quantized’, energy.) Thus, observing the wavelengths where the dark bands occur, it is possible to infer something about the nature of these molecules, and of the states in which they are found. One of the absorption lines in the spectrum of t, Oph is at a wavelength of 3875 Angstrom units (38.75 millionths of a centimetre), indicating the presence in the interstellar cloud of a molecule, cyanogen (CN), consisting of one carbon and one nitrogen atom. (Strictly speaking, CN should be called a ‘radical’, meaning that under normal conditions it combines rapidly with other atoms to form more stable molecules, such as the poison, hydrocyanic acid [HCN]. In interstellar space CN is quite stable.) In 1941 it was found by W. S. Adams and A. McKellar that this absorption line is actually split, consisting of three components with wavelengths 3874.608 Angstroms, 3875.763 Angstroms, and 3873.998 Angstroms. The first of these absorption wavelengths corresponds to a transition in which the cyanogen molecule is lifted from its state of lowest energy (the ‘ground state’) to a vibrating state, and would be expected to be produced even if the cyanogen were at zero temperature. However, the other two lines could only be produced by transitions in which the molecule is lifted from a rotating state just above the ground state to various other vibrating states. Thus, a fair fraction of the cyanogen molecules in the interstellar cloud must be in this rotating state. Using the known energy difference between the ground state and the rotating state, and the observed relative intensities of the various absorption lines, McKellar was able to estimate that the cyanogen was being exposed to some sort of perturbation with an effective temperature of about 2.3° K, which could lift the cyanogen molecule into the rotating state. You publish your paper and the scientific community’s in an uproar. What is this radiation? From the origin of the universe? Can we tell the age of the universe just from this? Everyone gets into the action. As we have seen, at the time of the discovery by Penzias and Wilson there already was another effort under way in New Jersey to detect a cosmic microwave radiation background. Soon after the original pair of papers by the Bell Laboratories and Princeton groups, Roll and Wilkinson announced their own result: the equivalent temperature of the radiation background at a wavelength of 3.2 centimetres was between 2.5 and 3.5 degrees Kelvin. That is, within experimental error, the intensity of the cosmic static at 3.2 centimetres wavelength was greater than at 7.35 centimetres by just the ratio that would be expected if the radiation is described by the Planck formula! a temperature between 2.7° K and 3° K.
It’s confirmed. Various wavelengths are measured and their energy distributions all line up. How awesome. You call your friends at MIT and they tell you about a young theoretical physicist named Dr. Pebbles. He’s also worked out a model which predicts this background radiation. It’s time to visit him and exchange ideas. You’re thrilled when you receive a letter in the post. Remember all that expensive research you couldn’t afford personally? Well, it’s now starting to happen. The National Science Foundation is willing to dish out some serious money to get answers. Rockets and balloons are sent up into space to do measurements. And of course, you’re right there in the action. It’s time to make a trip to Berkeley and help out with some measurement balloons. It has only been possible to attack this problem by lifting an infra-red receiver above the earth’s atmosphere, either with a balloon or a rocket. These experiments are extraordinarily difficult and at first gave inconsistent results, alternately encouraging either the adherents of the standard cosmology or its opponents. A Cornell rocket group found much more radiation at short wavelengths than could be expected for a Planck black-body distribution, while an MIT balloon group obtained results roughly consistent with those expected for black-body radiation. Both groups continued their work, and by 1972 they were both reporting results indicating a black-body distribution with temperature close to 3° K. In 1976 a Berkeley balloon group confirmed that the radiation energy density continues to fall off for short wavelengths in the range of 0.25 centimetres to 0.06 centimetres, in the manner expected for a temperature within 0.1° K of 3° K. It now seems to be settled that the cosmic radiation background really is black-body radiation, with a temperature close to 3° K.
And so the epic life of a physicist continues. With every observation you become that much closer to solving the problem of the origin of everything. What began as some static received your radio dish has now led to telling evidence toward the big-bang and the evolution of the universe. In what other field could you possibly live this epic of a life? There is none. Just as the Greeks believe the Earth was the center of the universe future people will look upon our beliefs and wonder what the heck we were thinking. But yet that cycle continues and we can’t possibly know everything. Ahh, the nature of science.